Do you have orphaned paper pieced blocks lying around? Well I do ~ and then some! 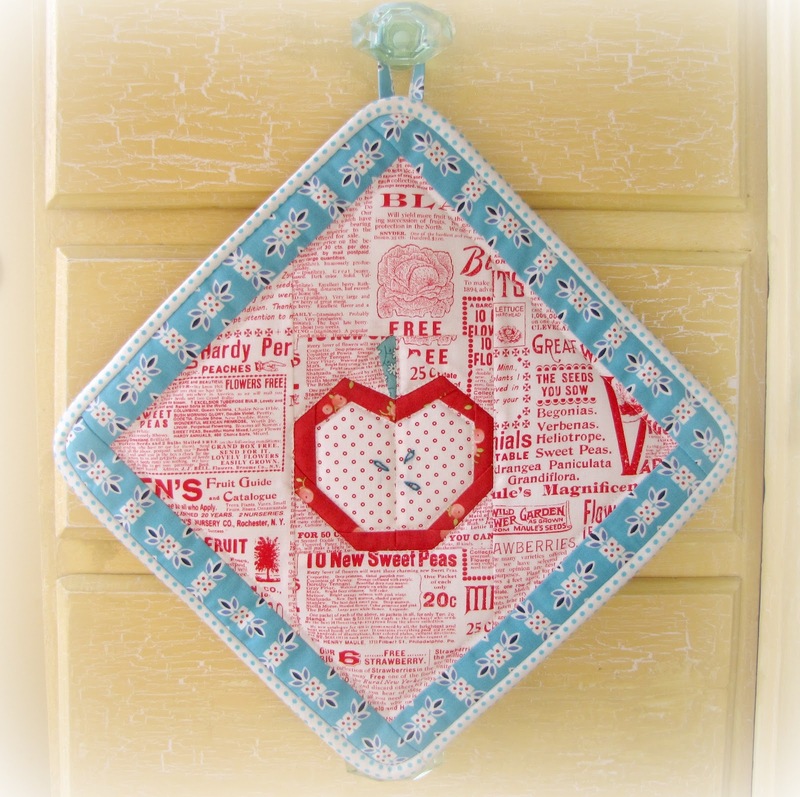 So when Kristy asked me to be a part of her Practically Paper Pieced Blog Hop I jumped at the chance. The Hop is all about making something out of your orphaned blocks. The Hop runs through August and the projects are just wonderful! I promise you will be inspired! I made a bunch of paper pieced apples months ago and thought they would be perfect for a frame pouch. I have been wanting to try to make a frame pouch for ages! 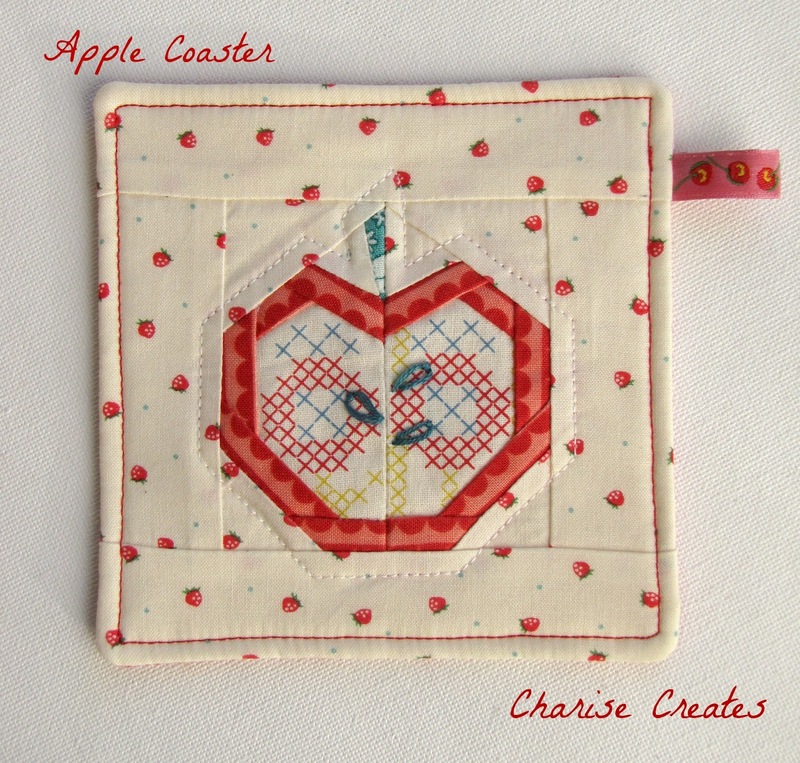 I used my free apple pattern which you can find HERE. The frame pouch tutorial is from U-Handbag Here. It is a fabulous tutorial!! Great, easy to follow instructions! My frame measures 5" wide and I found it at Joann Fabrics. *I chose to stitch my frame to the pouch instead of glue it. It is a bit tricky but I love the detail added from the contrast stitching. Here is a little tip: position your purse in the frame, baste, and start stitching from the middle to the edge. I used Perle Cotton Embroidery floss. The finished pouch is 6" high x 8 1/2"wide, so with a 1/4" seam allowance my block measured about 6 1/2" x 9". *I then added a layer of batting and lining and quilted my pattern. * I stitched box corners that are 1" from the point at the bottom and 1 1/2" deep. Instead of using interfacing as in Lisa's tutorial, I used cotton batting since I wanted to quilt my purse and give it a bit of softness. This pouch also uses my apple pattern but the apple was enlarged to 3 1/2" wide. I used the same 5" frame. This purse measures 6" high x 6 3/4" at the widest point. 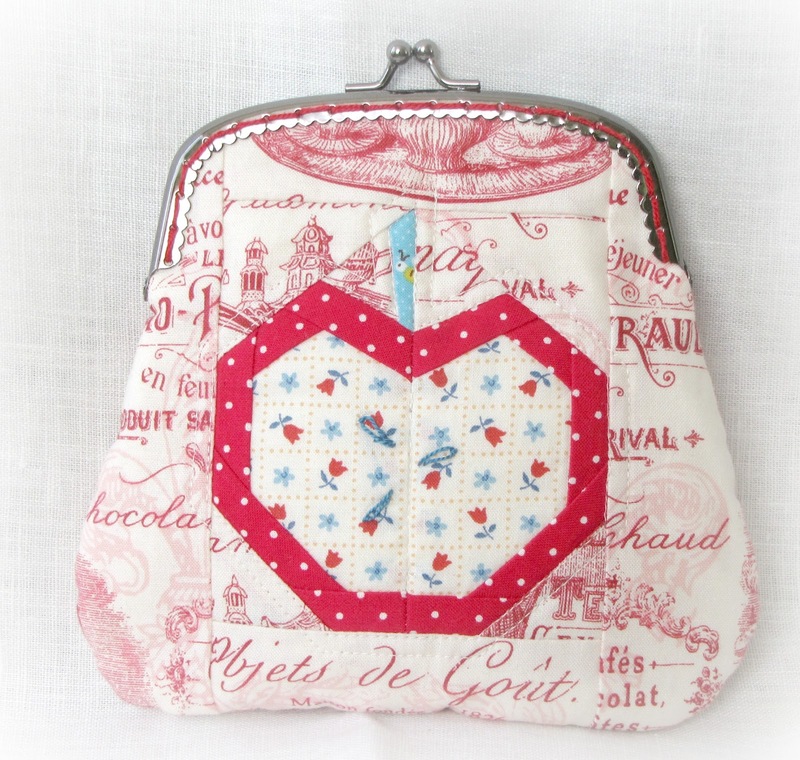 I also used batting in this pouch and did some echo quilting around the apple. 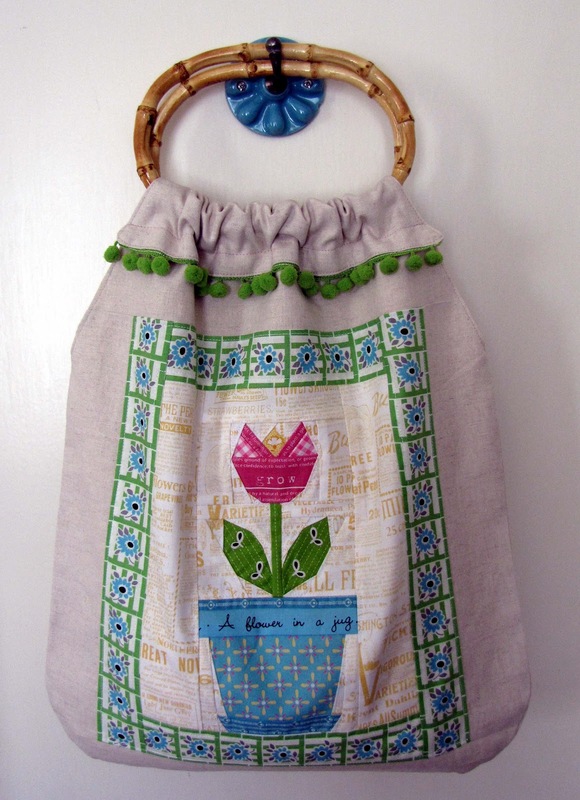 This bag was made from my free Tulip pattern which you can find here. Thanks for stopping by and don't forget to check out the other bloggers during the month of August. Oh... and take a peek at the Flickr group. There are some fab projects popping up there! I absolutely love those little purses Charise! The apples are so sweet and as always - your attention to detail really makes them fab. Thanks for the tutorial link - frame purses are on my "want-to-make-someday" list! those apple purses are so cute! It's a really clever block! Ok frame purses are coming up on the Zakka Styler Sew Along and they have me scared - so I will take a look at the tutorial you posted for tips. I am assuming that the purses all have a lining. Thanks for joining in on the blog hop. I am always cheered by your creations when they pop up on Flickr. This little apple selection has me smiling. Wow. 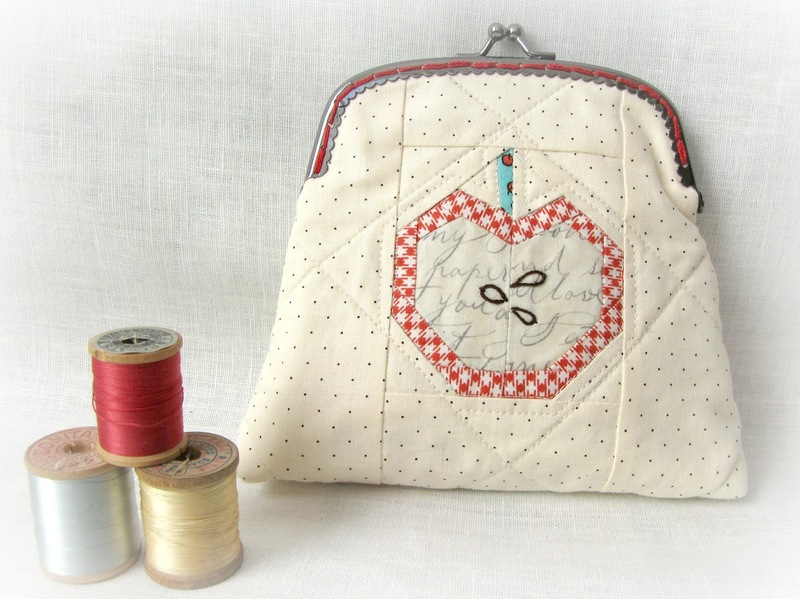 Such a cute apple pattern and very well done on the frame clutch. I haven't dare try it yet, but so many bloggers seem to master it, so this might inspire me to actually try! Sucha great use for your beautiful apple blocks! I especially love the frame purse (also on my list of things to try) and the pot holder. I like everything you've done with your blocks! Great makes! I'm excited to try more of your patterns. What a great idea for using small orphaned blocks! Thanks so much for sharing those gorgeous purses and other projects with us! Cute use of the apples! I love the little bag the best. I like all your projects; the tulip bag is a favorite. Thanks for sharing. Your apple creations look "delicious"! Seeing all of these great items is very inspiring. Your work is absolutely stunning! 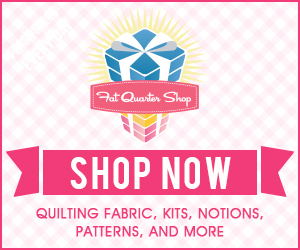 I love all your fabric choices... now I am going to have to make myself a coin purse! I am now a follower of your blog - Love It! this blog hop is such a great idea. i love your apple coin purses in particular. that block is so lovely.